Most of the software cover thumbnails are clickable and link to full-size scans of the front and back covers and the manual and package inserts, if any. In some cases the manual scans are linked separately. Most of the ZIP files contain Apple disks in DSK format that can be run with Apple II emulator software. 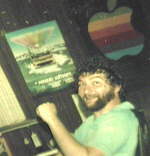 Do an Internet search on "Apple II emulators" and you'll find a variety of programs such as AppleWin that will let your multi-gigahertz computer act like a 1 megahertz Apple II. If you have an actual Apple II, this CFFA3000 card looks cool. Put your DSK files on a CompactFlash or a USB drive, plug it into your Apple, and go! A few of the archive files are in PC and other formats, thanks to contributors. You'll find them labeled as such throughout the site. Most of our original work was on the Apple II and Macintosh, though, and then ported to systems like Atari 800, Commodore 64, IBM PC, Amiga, and Atari ST. Best graphics versions at that time were on the Amiga and Atari ST. This site has been around since the 1990's, but in 2013 and 2014 the archives got an extreme makeover with about five times as much of the old software, plus new scans of most of the manuals, instructions, and game inserts. Special thanks to Ken Buchholz at Apple2Online.com for almost all of the new DSK files and for many of the scans. 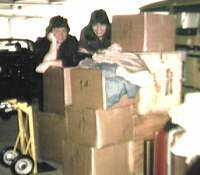 You can also find an extra set of most of the archive files at that site. Be wary of "cracked" copies of the software you might find on sites other than here and Apple2Online. While the application software was not copy-protected, the games were. Some of the games had a "feature" that allowed cracked copies to work but only to a point, much like a trial version. When that point is reached in a cracked copy, you become faced with a puzzle or situation that is unsolvable and you can only continue with an authentic copy of the game. Our help-line people had fun answering callers who were asking for tips on how to get past those particular "puzzles". Physical copies of much of the software and other paraphernalia can now be found at the International Center for the History of Electronic Games at the Strong National Museum of Play in Rochester, New York, and at the Geneva History Center in Geneva, Illinois. 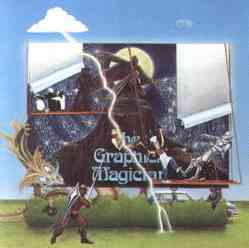 Copies of the graphics software are in the archives at the Smithsonian National Museum of American History. The copyrights to the programs posted here are held by Mark Pelczarski, with the following exceptions: Antonio Antiochia holds copyright to the game portions of Transylvania, Crimson Crown, and Transylvania III. Eagle Berns and Holly Thomason own the copyright to the game portion of The Coveted Mirror. dynamix owns the copyright to Stellar 7.